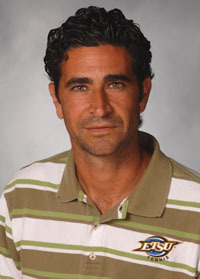 Yaser Zaatini is the director of ETSU tennis and serves as head coach of the men’s tennis team at ETSU. Zaatini is from Venezuela. Growing up, his parents were loving and gave him many opportunities at a young age, like playing tennis, which he is very grateful for. Zaatini is entering his 14th season as the coach at ETSU. During his playing career at ETSU, Zaatini was a two time All-American, won four championships and holds the record for wins in a season three times. In his career at ETSU, he holds the record with 134 wins. As a coach, in just 13 years he has a record of 226 wins and 90 loses as the men’s head coach. In the past five years as the head of the women’s team, he has a record of 70 wins and 37 losses. He’s never had a losing season coaching the men’s and women’s teams. He is a nine-time Coach of the Year winner in the SoCon and Atlantic Sun conferences. Of all the coaches who have influenced his coaching career, the coach who has been the most influential has been his coach, Dave Mullins. With all his connections back home and many great international players, Zaatini has one that he feels may be the best he’s ever coached. That is Enrique Olivares, who was ranked top 10 in the country at No. 9 in 2009. He was the highest ranked tennis player at ETSU since Zaatini, who was ranked No. 4 in 1993. This season, the Bucs are looking to get rolling with wins. Previous post Was Joining SoCon A Good Move?